is an award winning drummer and educator. 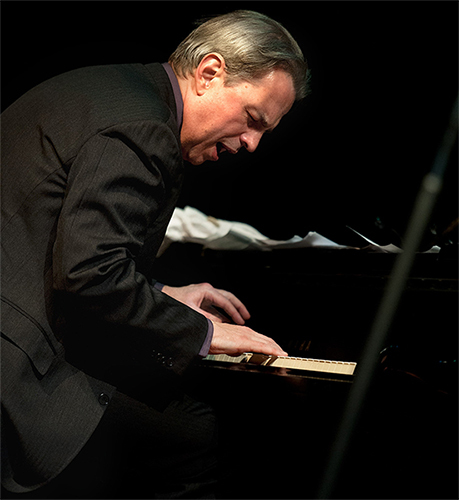 Besides being a full time musician, he performs widely with various bands in and outside the U.S. Julian is best known in Bellingham, Wa., for his performances with his own trio consisting of pianist Miles Black and bassist Michael Glynn. He has performed with long-time friend saxophonist and promoter Cory Weeds, also with a modern trio comprised of saxophonist Josh Cook and bassist Michael Glynn as well as the swing era bands of Solomon Douglas. He loves and enjoys performing all styles of jazz from traditional, to swing, be bop, and modern. His love of great rock, funk and americana music in addition to jazz has helped make him an in demand studio drummer, having appeared on over 70 recordings. Besides performing over 200 times a year, Julian keeps busy with his love of teaching, instructing not only drums, but jazz combos as part of the Whatcom Jazz Music Arts Center's high school combo programs. He has had the honor and privilege of performing and touring with Harold Mabern, Jimmy Heath, Peter Bernstein, Larry Willis, Seamus Blake, Geoffry Keezer, Jon-Erik Kellso, Grant Stewart, Eric Alexander, David Hazeltine, Joey DeFrancesco, Vincent Herring, Steve Davis, Josh Bruneau, George Cables, Gary Smulyan, Julian Preister, Aaron Parks and many many others. Along with drummers Michael Shrieve and Gene Coye, image from the Julian MacDonough Trio performance at the CONOR BYRNE PUB during the Ballard Jazz Festival in Seattle, WA as part of the "Brotherhood of the Drum". "Bellingham jazz drummer and educator Julian MacDonough has been operating Whatcom Jazz Music Arts Center at The Majestic on North Forest Street since October, and says its has already had a wonderful impact on the community. 'It has brought together a lot of different people from different walks of life who share a common love of jazz music,' he says." 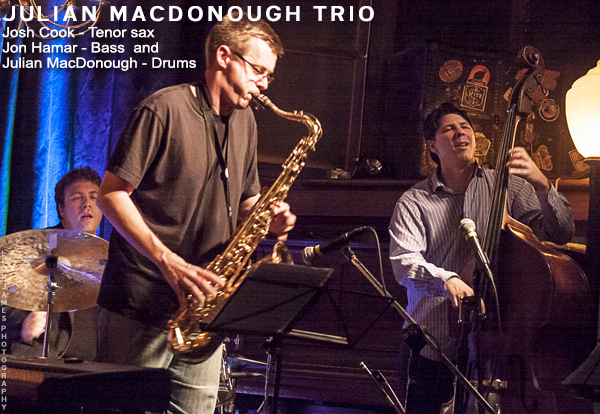 "The spirit of jazz is burning bright in the heart of Julian MacDonough. Some may say it's an old or tired genre but he doesn't believe it for a second... In fact he believes that jazz can blossom in the public eye once again if someone would just be willing to put on the shows and teach it to the kids. That's where the Whatcom Jazz Music Arts Center comes in. A personal project for MacDonough, he is hoping the Center will help ignite the passion that he feels for jazz in the younger generations of upcoming musicians as well as the community." "Northwest + 1 is a group of five jazz musicians, all educators that were brought together in a routine guest artist appearance at Spokane Falls Community College in June of 2013, by trumpeter/educator Kevin Woods. Woods along with his SFCC colleague pianist Danny McCollum, assembled a rhythm section of Washington's finest with Jon Hamar on bass and Julian MacDonough on drums to fill out the group of Northwestern based musicians. " "A few months ago, Bellingham drummer Julian MacDonough was seeking a space for what he envisioned as a performance and educational space for local musicians. When plans for the original space he had in mind (at Bay Street Village) fell through, he kept looking. A couple of weeks ago, he found a space. The Whatcom Jazz Music Arts Center will open celebrate a grand opening Nov. 5 at the downstairs club space at the Majestic, 1027 N. Forest St."